We can install up to thirty fence posts per hour if the soil conditions are ideal! With the onset of wetter weather, posts are installed much easier in this season. 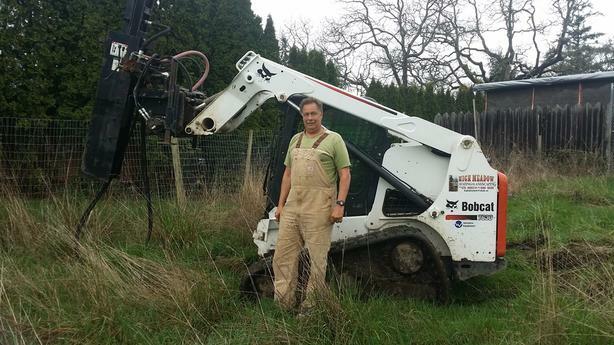 High Meadow Fencing has the equipment and knowledge to get the job done. We have two methods for post installation including: Vibration and Drilled holes. In addition, we build many styles of fencing to suit your needs. Whether it is to keep animals in or out we can do it! This includes: Deer Fencing, Riding Rings, Paddock, Page Wire Fencing, Various wooden designs, Split Rail Fencing and more. Do you have a drainage problem? We can fix it! Give us a call and book your installation. Prices vary depending on: soil type, lay of the land and fencing style. We can also build new or renovate existing outbuildings and barns.